It’s Fall In A Jar! Did I mention it contains no added sugar? Just the natural sugars from apples and pumpkin. Each tablespoon contains just 3 grams of carbohydrates, compared to commercial apple butter (8g/tablespoon) and Trader Joe’s pumpkin butter (10g/tablespoon). Now, get out your crock pot. Make a mad dash to Wally World (or some other store that sells giant jars of unsweetened applesauce) for the ingredients. Roll up your sleeves. Let’s make some Pumpkin Apple Butter! To cut back on sugar, I brewed calorie-free Cranberry Apple Zinger tea to use in place of apple cider, which contains roughly 25 grams of sugar per cup. 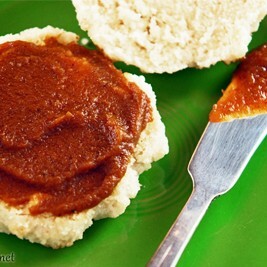 I really love the flavor that the herbal tea added, and will always make apple butter this way. You could try substituting Cinnamon Apple Spice tea if you cannot find the Cranberry Apple in stores. If you don’t mind a more tart spread, you can make a paleo version using just stevia extract. 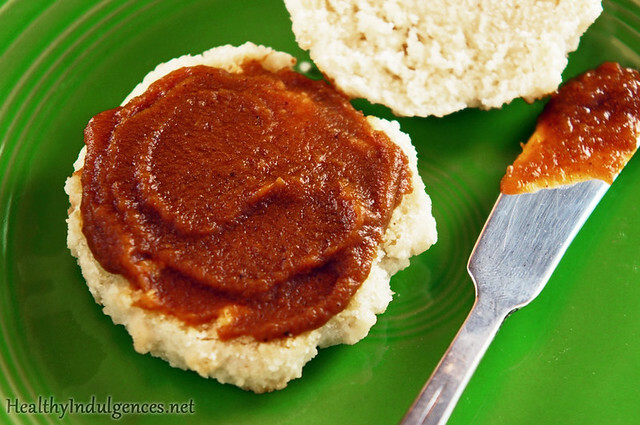 True apple butter is very sweet, so I recommend using multiple sweeteners. Truvia contains a combination of stevia and erythritol, which is why it works so well here, not leaving any aftertaste. Coconut palm sugar or honey would complement the sweetness of stevia nicely, and are appropriate for the paleo plan. Just add sweeteners, taste, and adjust till you get it right. Make this tasty lower-glycemic alternative to apple butter, weaving together the flavors of fall in a creamy and spicy spread that’s delicious on grain-free Fluffy Biscuits or meat (pork chops, anyone?). You could also swirl this sweet spread into mini cheesecakes for an elegant seasonal dessert. 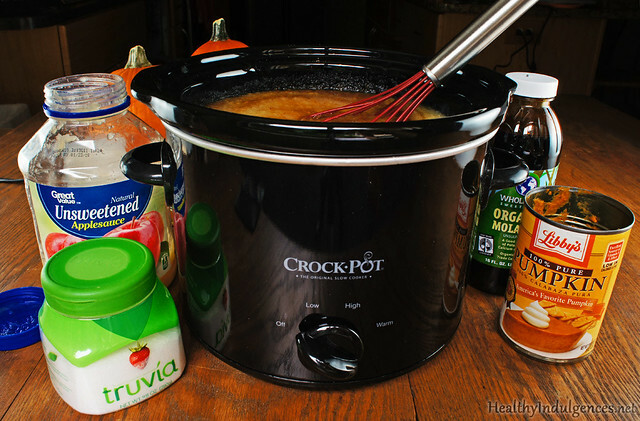 Add all ingredients to crock pot. You can whiz the ingredients in a blender first before adding them to a crock pot to get a “buttery” smooth texture. Whisk mixture until uniform in color. Turn crock pot up to HIGH for 2-3 hours, with the lid cracked to vent the moisture. Turn to low and cook overnight (12-18 hours), or until the spread is thick enough to hold its shape on a spoon. You just want to cook off most of the water. That’s all there is to it! Dump mixture from your crock pot into a clean bowl. Any burned bits will stick to the sides, so don’t scrape down your crock. Use a hand blender (I used my Cuisinart) to blend up the spread so that it is smooth and free of lumps, if you didn’t blend the mixture before adding it to the crockpot. Spoon mixture into clean jars. 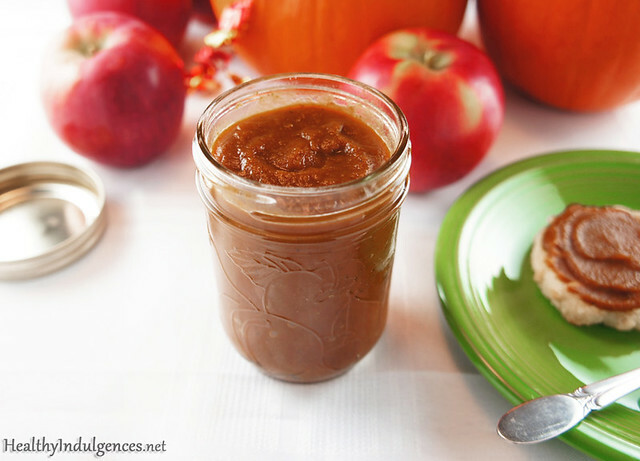 Enjoy your Pumpkin Apple Butter, and give a few jars away to share the wealth! 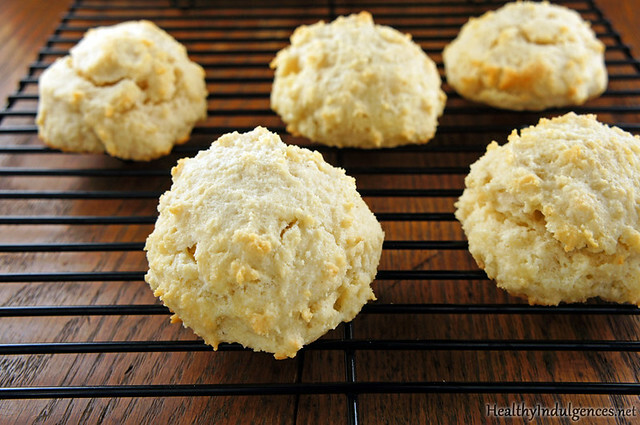 These Perfect Paleo Biscuits are an updated version of my grain-free, low carb Fluffy Biscuits (see below for the recipe). My friend Lindsay at the Veterans Affairs Clinic, where I volunteer, wholeheartedly approved of the new-and-improved Fluffy Biscuits. She has to eat gluten-free, so I invited her to perform the official taste test. “They’re just like Bojangles!” she exclaimed. Sweet victory! During my time at Duke University in Durham, North Carolina, I’d eaten enough Bojangles biscuits to appreciate the comparison. If you’re from North Carolina, you know what I’m talking ’bout. Preheat oven to 400 degrees Fahrenheit (204 degrees Celsius). Cut cold fat (butter or shortening) into dry ingredients with the tines of your fork, rotating the bowl around with your other hand until the mixture has pea-sized chunks throughout. Optional: Chill mixture in the fridge for 5-10 minutes or as long as you can stand it. The longer the better. The more the fat can get cold and hard, the puffier your biscuits will be. Remember that! Separate the egg yolks from the whites (using the shell halves to tip the yolk back and forth a few times). Reserve yolks (save all that creamy goodness for ice cream or homemade mayo!) and whisk egg whites with a fork in a bowl for 20 seconds, until no longer stringy and gloopy. You just want ‘em a little foamy. Remove mixture from fridge and whisk in the egg whites, breaking up any massive chunks in the dough with your whisk or fork. Whisk in a splash of heavy cream or coconut cream (for paleo biscuits) at the very end. Drop 4 mounds of dough on to a parchment paper lined cookie sheet. Bake for 12-14 minutes, or until biscuits are slightly golden on the tops. 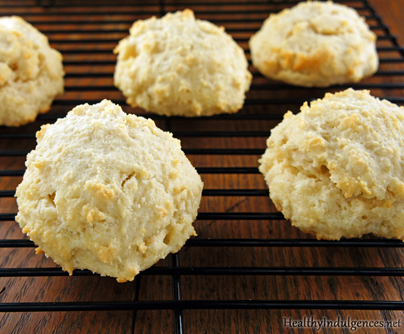 You can use non-hydrogenated shortening in place of coconut oil in this recipe for dairy-free biscuits with a more neutral taste. Per 1/5 recipe: 213 Calories; 19g Fat; 8g Protein; 7g Carbohydrate; 3g Dietary Fiber; 16mg Cholesterol; 204mg Sodium. Those biscuits look wonderful! I make the old version all of the time. How do these taste different from the old ones, Lauren? Hi, Sherry! This version of the biscuits has a less spongy texture. It is more soft, as opposed to springy. Everyone who has tried them has been impressed! Let me know what you think of the updated version. I’m a little confused. Step 4 says to pour the dough into ramekins or muffin tins and get them in the oven, but then step 5 says to whisk in heavy cream and drop onto a parchment lined sheet pan. Are these two different options or and I missing something? Hi, Abbie! I’ve amended the instructions. Thank you for the heads up! Hope things are more clear now. Hi there!! I have a question about this recipe. We try to go apple picking every year. I’d like to use actual fresh apples for this instead of applesauce. However, I’m wondering if they do something to remove the natural sugars in unsweetened applesause? Or do they just not sweeten it? I guess they remove natural sugars, I probably should use that instead of real apples to keep it more THM friendly? Hi, Kathy! Fresh apples would be great. You wouldn’t have to do anything to the apples except peel and chop ’em and toss ’em in the crockpot. 🙂 As long you use the same weight of apples as applesauce, and peel and chop them before adding to the crock pot, the recipe should work well. I’ve never gone apple picking, but it sounds like blast. Let me know how the butter turns out for you! Hi Lauren. I’ve been making your original biscuit recipe for Thanksgiving for years. I just made these…and I’m switching over! They are less wet and sponge than the original. Thanks! Pan, it’s great to hear confirmation that this new biscuit recipe beats the old one! Thanks for the feedback. Are the cloves and ginger ground? Yes, Melissa. I will update the recipe to reflect that. Lauren, If I put the apple butter hot & fresh from the crockpot into clean jars & have heated my lids to get a good seal once the rings are on—refrigerate & use within 30 days? Shelf stable for a few months? I’m very new at the canning thing. Thanks! P.S. BOTH recipes are fabulous, btw! I don’t see carb count/biscuit could you verify this for me? Hi – can you confirm the carb count per muffin? Thanks, they look amazing! Nikki, the carb count can be tallied using the calorie counter at about.com. I will be updated old entries with detailed nutrition facts when I can. Hope that you enjoy the biscuits! Hi! Do you have to use egg whites or can you use whole eggs? Happy to hear you enjoyed the biscuits! The soup sounds delish, too! Can I use almond milk in place of cream? Jain, I have not tried them with almond milk but they work well with coconut milk. Can I use pasteurized egg whites from a carton? I’ve started buying cartons because most of the healthy recipes I use do not use egg yolks. Since you only whisk them instead of beating them until foamy (carton egg whites won’t do that), I think it should be ok? Thanks! Just discovered your website and already have several recipes on my to do list for right away! Love your approach! it would end energy scarcity ("too cheap to meter"), yet it made the rich richer and the Earth more poisoned and precarious.We need nondestructive values, not just powerful technology. Technology can help promote those values (as social media helped the Arab Spring), but the process is not automatic. like i just made an account toady and i learned that u need a credit card to do it , but i dont have one so i was wondering do you have to cancel ur account even if u didnt sighn up for one of the offers or can i stillï»¿ keep my account. ALGUÃ‰M QUE DIGA AO CAVACO PARA VER AGORA A RTP1 E DIGA AOS INTERVENIENTES O SEGUINTE:- DEUS NOS LIVRE DE FICARMOS IGUAIS Ã GRE!ICA‰LAMENTÃVÃL O QUE UM GAJO TEM DE OUVIR DE UM ALTO CARGO DA NAÃ‡ÃƒO QUE AINDA POR CIMA ACHO QUE JÃ Ã‰ ADULTO!?!? This is totally AWESOME Donna! This new sentiment could not be more perfect for these cuppies (you are too clever!) and I LOVE the layout and papers!! hey its good that the TNPCEE was finally abolished! how many exams can a person write? when i was lookin for an undergrad school, i had to write a different exam for every state! in al i mus have written atleast some 10-15 exams! i was sooooooo sick! It is mind boggling that these incompetent fools keep getting voted in! They have consistently mishandled the budget from the get-go… We even signed up for a 20 year(!) forced green bin contract (we pay whether we provide enough garbage or not) when the Plasco plant is just about ready to go producing power from the same garbage… No special collection required.